I occasionally get letters from readers. It is a pleasure to correspond with others of similar interests. Every once in a while someone will leave a comment and/or photo worth sharing (with the writer's permission, of course), and that's what this page is for. You can email me at bill_qualls@hotmail.com. As you once wrote, "The San Gabriels really are remarkable"; so true, this is a photo I took a few months ago on the Lower Sam Merrill Trail above Altadena. This is a highly traveled trail, very busy on the day I hiked it, so the last thing I expected to see while rounding a corner was this sight before me, right out of National Geographic magazine. 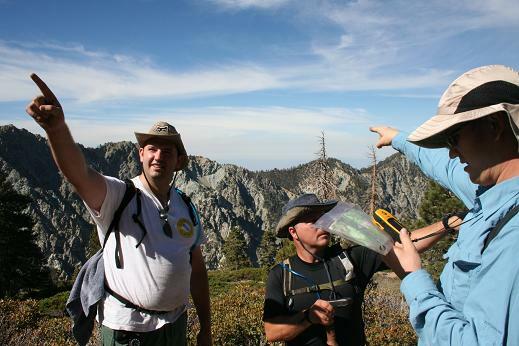 Loved your photos on the Mt Baldy, Baden-Powell, Gorgonio hikes! I've been in Riverside for three years now, moved here from the Chicago area for my job. I am having difficulty finding others to hike with. 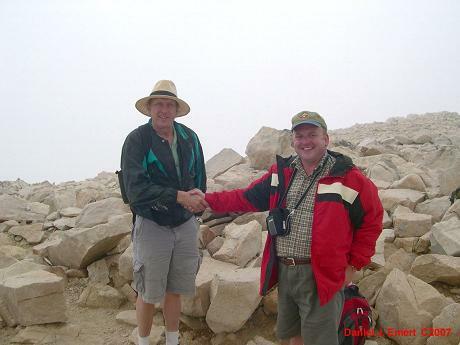 My colleague Ken and I did get a great hike to Baden-Powell summit on the Sunday before Labor Day, Sep 4, 2005. 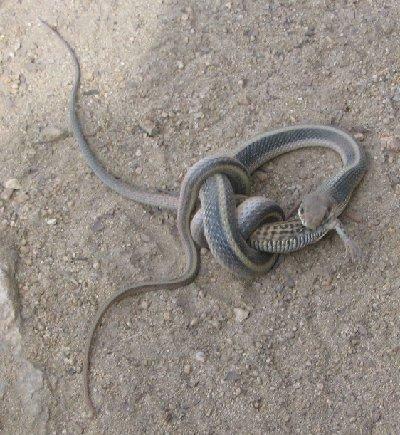 Here's a pic from that hike. Keep up the site and the hiking. Would love to connect with you guys in the future. 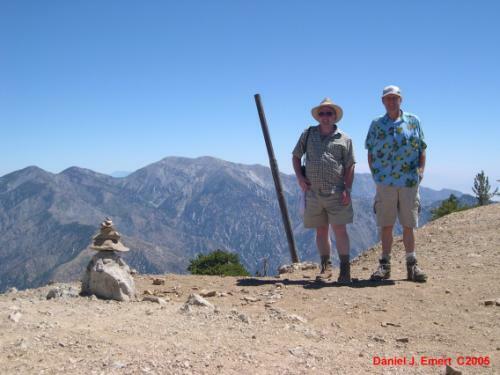 Our Mt Baldy Hike on Sunday, September 24th, 2006 was a difficult, steep climb via the "backbone", but with God's speed. To quote a line from President Nixon would sum up our feeling once on the summit; "You'll never know how beautiful the view is on top until you've traveled in the darkest valleys, with only a dream and persistence to trudge your way up to success". Dan and Ken on Mt. Baldy! 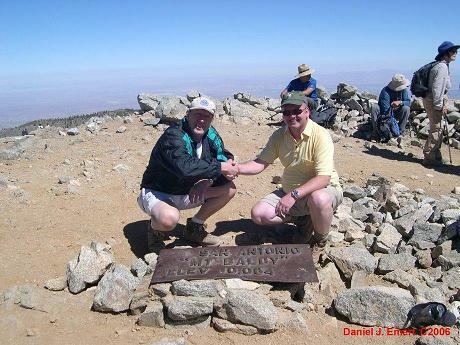 Mt San Jacinto Peak is the third summit Ken and I have achieved in the last three years. This hike was one of the best and easiest we have taken on and was also the most scenic with its variety of flora, canyons and camp sites along the way. We took the Palm Springs Aerial Tram to the Mountain Summit, and then the 5.5 mile hike to the peak. We recommend this hike many times over to anyone who has not yet experienced the beauty of the San Jacinto State Park Forest and the fantastic views from the summit. James, Ben and Mike (left to right) are the regulars that come with me on my monthly hikes. This is on the way up. Notice that they are all still smiling, that’s how you can tell we are not on the last steep portion on the Vivian Creek trail to San Gorgonian peak. 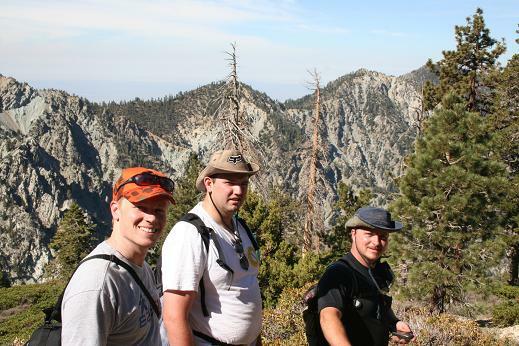 Anyone who has hiked the Vivian Creek trail to San Gorgonio should recognize that ridge in the background! Ben, Mike and Dave (left to right). Mike and I are www.geocaching.com members so whenever we go on a hike we want to pick up some caches on the way. So with our GPS and topo maps we both search out for one. Ben on the other hand wants to keep going up and forget the caches. 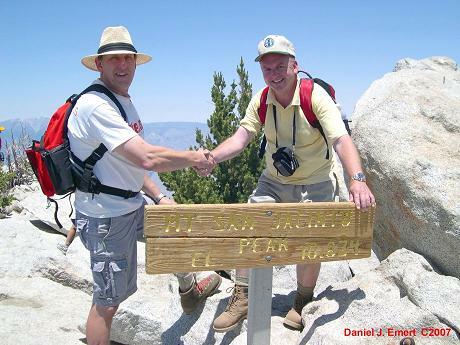 This is the fourth summit peak Ken & I reached since our first summit achievement together in 2005. The tallest peak in Southern California, Mt. San Gorgonio (elev 11,499 ft) was reached by way of the Vivian Creek Trail, the second most difficult trail known in Southern California. I know you can relate to this trail since you hiked it back in 2005. Ken and I were a bit disappointed in the weather when we reached the top of the peak and experienced zero visibility up there due to a weather front which moved in about 1 hour before reaching the summit. It was a feeling of accomplishment though, especially for a cornfield boy like me from Illinois who never lived in this region of the country until just four years ago. I have wanted to grab this summit from the week I first moved out here, since I first viewed the peak from my work place parking lot. It's exhilarating once on the top to think of how few humans from the general population have successfully endured the Vivian Creek Trail and made it to the top of this great mountain. We encourage all serious hikers to take on this trail to this marvelous peek. Ken & I are definitely going back next year so we can get some clear pics from the summit of the spectacular views, probably via the Vivian Creek trail again. Our next big peak... probably Mt Humphrey (elev 12,633 ft) in the San Francisco mountain range at Flagstaff, AZ. Copyright © 2006 by Bill Qualls. Last updated September 13, 2007. All photos are copyright © their respective contributors.